HAILING FROM YORKTON, SASKATCHEWAN AND PRODUCT OF THE ROYAL CANADIAN AIR CADETS, COLONEL BRYSKI SERVED FIVE YEARS IN THE ROYAL CANADIAN NAVY AND 33 YEARS IN THE ROYAL CANADIAN AIR FORCE AS A COMMUNICATIONS AND ELECTRONICS (AIR) OFFICER. HE HAS BACHELOR AND MASTER OF ENGINEERING DEGREES FROM THE ROYAL MILITARY COLLEGE, IS A GRADUATE OF THE COMMAND AND STAFF COURSE. HE HAS SERVED THREE TIMES WITH THE US MILITARY AND NATO, INCLUDING HIS CURRENT TOUR AS LIAISON OFFICER AT US STRATEGIC COMMAND, A POSTING AS NATO AWACS MODERNIZATION PROJECT MANAGER AND A ONE YEAR DEPLOYMENT TO KANDAHAR, AFGHANISTAN AS CHIEF OF STAFF IN AN US ARMY HQ. 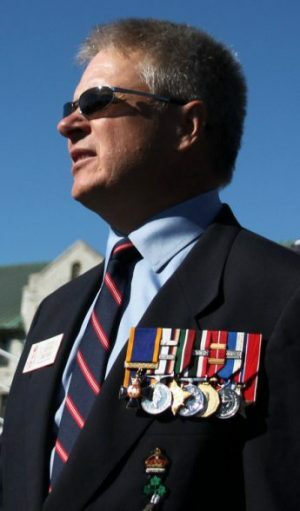 IN OTHER INTERNATIONAL EXPERIENCE, HE WAS CHAIR OF THE EXECUTIVE GROUP FOR THE FIVE EYES COMBINED COMMUNICATIONS AND ELECTRONICS BOARD THAT ESTABLISHED THE PEGASUS INITIAL OPERATIONAL CAPABILITY, MENTORED THE CANADIAN SPACE TEAM AT THE SEVEN NATION SCHRIEVER WARGAME, SENIOR TEAM MEMBER AND REGIONAL FACILITOR AT THE 22 NATION NIMBLE TITAN INTEGRATED MISSILE DEFENCE EXPERIMENT AND WAS DETACHMENT COMMANDER OF THE ANNUAL EXCHANGE WITH NEW ZEALAND DEFENCE FORCE IN AUCKLAND, NZ. HE IS ESPECIALLY PROUD OF HIS EFFORTS TO ENABLE THE FIRST EVER PARTICIPATION OF CAF IN THE US STRATEGIC COMMAND’S GLOBAL THUNDER EXERCISE WHICH FOCUSES ON CYBER, SPACE MISSILE DEFENCE AND NUCLEAR READINESS AND STRATEGIC DETERRENCE. COLONEL BRYSKI’S COMMAND APPOINTMENTS SPAN THE TEAM TO FORMATION LEVEL. HE WAS COMMANDER, 76 COMMUNICATION GROUP IN OTTAWA FROM MAY 2010 TO JUNE 2012. HE WAS COMMANDING OFFICER OF THE CANADIAN OPERATIONAL SUPPORT COMMAND HQ IN OTTAWA IN 2009-10 AND CANADIAN FORCES CRYPTO MAINTENANCE UNIT IN KINGSTON, ON FROM 1992-5. HE WAS FLIGHT COMMANDER OF 19 WING COMOX TELECOMMUNICATION AND INFORMATION SYSTEMS IN COMOX, BC FROM 1999-2002. ADDITIONALLY, HE LED THE 19 WING NIJMEGEN TEAM, WHICH WON THE WOODHOUSE TROPHY FOR OUTSTANDING ESPRIT DE CORPS. IN A SENIOR STAFF ROLE, COLONEL BRYSKI SERVED AS DIRECTOR IM PROJECT PLANNING AND CONTROL, CHIEF OF STAFF TO DIRECTOR GENERAL INFORMATION MANAGEMENT PROJECT DELIVERY AND AS A SECTION HEAD WITH THE VCDS IN THE DIRECTORATE OF FORCE PLANNING AND PROGRAMME COORDINATION AT NDHQ OTTAWA. HE IS EXTREMELY GRATEFUL FOR ALL THE SUPPORT AND CAMARADERIE FROM LEADERS, CO-WORKERS, COLLEAGUES, ALLIES AND ESPECIALLY SUBORDINATES OVER HIS CAREER. HIS DEPARTURE WITH DIGNITY CEREMONY WILL TAKE PLACE IN A RELAXED FORMAT AT HYLANDS GOLF CLUB, UPLANDS, OTTAWA ON THE MORNING OF MONDAY 28 AUGUST 2017, CONSISTING OF A ROUND OF GOLF FOLLOWED BY LUNCH AND MORE FORMAL PRESENTATIONS. 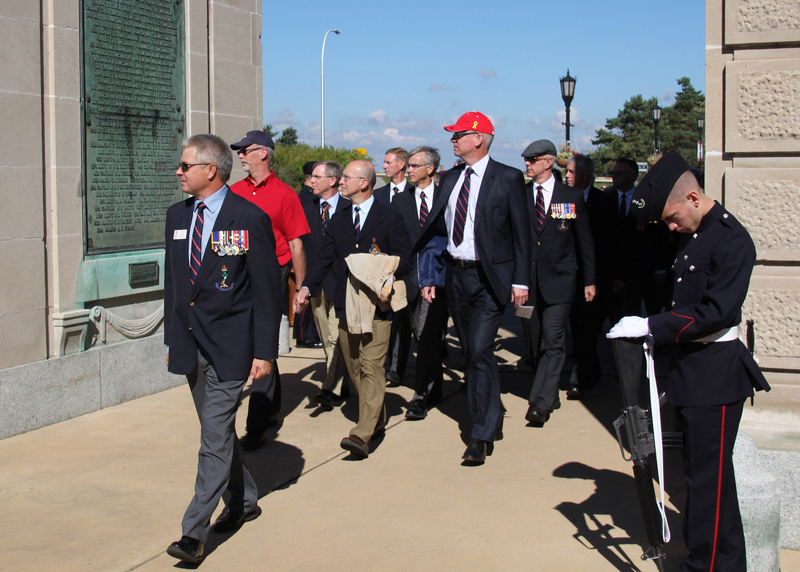 PLEASE RSVP BY 24 AUGUST TO MAJOR ANDY WOOD (ANDREW.WOOD2@FORCES.GC.CA) TELEPHONE (613) 995 6373. LE COLONEL BRYSKI A SERVI COMME DIRECTEUR DE LA PLANIFICATION ET DU CONTRÔLE DU PROJET DE LA GESTION DE L INFORMATION, CHEF D ETAT-MAJOR AU DIRECTEUR GENERAL DE L A GESTION DE L INFORMATION POUR LA LIVRAISON DU PROJET ET EN TANT QUE CHEF DE SECTION AU BUREAU DU VCEMD AU SEIN DU DIRECTORAT DE LA PLANIFICATION DES FORCES ET DE LA COORDINATION DES PROGRAMMES AU QGDN A OTTAWA. EN 2010, LE COLONEL BRYSKI A ETE INVESTI DE L ORDRE DU MERITE MILITAIRE EN RECONNAISSANCE DE SES SERVICES MERITOIRES HORS PAIRS DANS DES POSTES DE RESPONSABILITES. IL A RECU LA MEDAILLE DE SERVICE MERITOIRE DE L OTAN, LA MEDAILLE DE L ETOILE DE BRONZE DE L US ARMY ET IL EST EN NOMINATION POUR LA LEGION DU MERITE DES EU. PASSIONNE DE GOLF AVEC SON EPOUSE ET, EN DEPIT DU SYNDROME DE LA MAIN DE PIERRE, IL EST UN FIER PROMOTEUR DE LA CULTURE CANADIENNE AU NEBRASKA EN JOYANT AU HOCKEY TROIS FOIS PAR SEMAINE, DU MOINS LORSQU IL N Y A PAS DE TORNADES. IL EST RECONNU COMME ENTRAINEUR AU HOCKEY DANS LA COMMUNAUTE D OMAHA. IL EST TRES RECONNAISSANT POUR TOUT LE SOUTIEN ET LA CAMARADERIE QU IL A RECUS DES CHEFS, COLLEGUES, ALLIES ET TOUT SPECIALEMENT DES SUBORDONNES TOUT AU LONG DE SA CARRIERE. MARIE DEPUIS 25 ANS AVEC MICHELLE, ILS ONT UNE FILLE TESIA ET UN FILS KY. LEUR INTENTION A LA RETRAITE EST DE PASSER DU TEMPS EN FAMILLE ET AVEC LES AMIS AU RETOUR DES ETATS-UNIS. ILS PLANIFIENT DE S ETABLIR DANS LA BELLE VALLEE DE COMOX. UNE CEREMONIE DE DEPART DANS LA DIGNITE DANS UNE ATMOSPHERE DETENDUE SE TIENDRA AU CLUB DE GOLF HIGHLANDS A UPLANDS, A OTTAWA LE MATIN DU LUNDI 28 AOUT 2017. ELLE CONSISTERA D UNE RONDE DE GOLF SUIVIE PAR UN GOUTER ET DES PRESENTATIONS FORMELLES. VOUS ETES PRIES DE RSVP AU MAJOR ANDY WOOD (ANDREW.WOOD2@FORCE.GC.CA) TELEPHONE 613-995-6373. I had the great pleasure of working in Ottawa with Kevin very early in his distinguished career, as volunteers with the Association of Public Sector Information Professionals in the 1980s. His many contributions to the CAF and public service are remarkable, and I wish Kevin and his family many happy years in retirement. Kevin, congrats on a such distinguished and accomplished career. Although it’s been a while since our indoc by Zee and his boys, the memories are so vivid it seems like only yesterday. When you finally arrive back out west I will have a few cold ones set aside. I’m pretty sure I still owe you more than a few for your assistance in getting me thru 1st year calculus (not to mention 2nd yr Electro Mysticism! ).